One advantage of me buying diecasts and models again is that I almost have all the stuff I need to finish off some wargames units I was planning. Reconnaissance units can be very important in WWII wargames especially in encounter type scenarios. 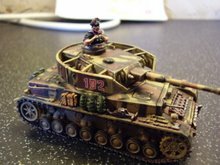 So I planned to paint up TWO complete battalions for the German side. One is late war, one is early war . I am putting the OOBs up here for reference. By the way these are WARGAMING OOBs tailored for the ruleset that I play; they are an APPROXIMATION of true OOBs, open to interpretation so nobody should get their knickers in a twist. Optional: I am not sure that there should not be a Heavy Company with towed AT, Engineer and possibly, by this stage of the war, light AA pl. I need to investigate this further but the original internet sources I made this OOB from have gone down. Note: I took liberties with the number of a/cars, there should be TWO a/car coys but because of the cost of the a/car models I have only one of these and TWO m/c coys instead. I like the late war recce units - I think that these were often a real mish-mash of stuff. My 28mm Saxons and Normans are well on the way to completion now - love them. Will put photos on my blog when I have got the bases done.